The Ellia Reflect Ultrasonic Essential Oil Diffuser is the perfect Valentine’s Day gift that will give a loved one a much-deserved home pampering session and a great night’s sleep. This premium diffuser uses the highest quality Ellia essential oils that helps reduce stress, boost mental clarity and soothes both the body and mind. The Ellia Reflect Diffuser has a stylish design, crafted from glass and wood, that gently lifts the scent of your favourite essential oils into the air and helps to transform the mood of the space you are in. This wonderful diffuser is simple to use as it comes with a convenient remote control. It also features colour changing lights, a library of relaxing and uplifting sounds, two essential oil samples and delivers up to 7 hours of continuous runtime. The colour changing light is fabulous as it gives a gentle glow that creates a peaceful addition to your environment. 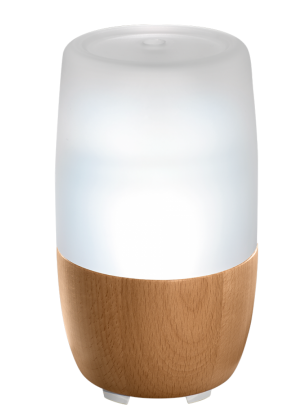 Another great feature is that this diffuser delivers a fine mist of natural aroma into the air that helps enhance your mood. I’ve tried the orange essential oil and adore how lovely my bedroom smells as I enter and gives me an uplifting, refreshing feeling. There are 14 Ellia 100% Pure Essential Oils that can be used with this diffuser so you can choose the perfect scent for a loved one. Two sample 2ml bottles of Peppermint and Orange also come with the diffuser to start you off. The Ellia Reflect Ultrasonic Essential Oil Diffuser is a wonderful gift for Valentine’s Day and will be adored by anyone who wants to feel more relaxed and pampered. The RRP is £89.99 and it is currently on promotion for £79.99. It is available from www.homedics.co.uk.